The Huawei Ascend P2 uses a 1.5GHz quad-core processor similar to that of the already announced Ascend D2. It has 1GB RAM and 16GB storage, which unfortunately is not expandable as there is no microSD card slot. Huawei's pre-MWC event opened doors at 2PM CET but the real press conference won't start until 3PM. Fortunately, they didn't just leave us hanging dry up there, they showed everybody the Ascend P2 a bit early. 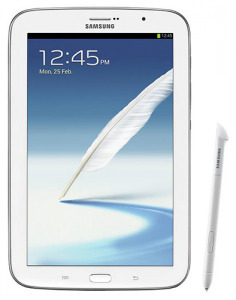 After making an appearance earlier today, the Samsung Galaxy Note 8.0 got officially announced. The compact Android Jelly Bean slate will be available worldwide in Q2 this year in Wi-Fi only, 3G and 4G LTE versions. Telephony support will also be available. Pricing is yet to be revealed.